The design of the current Subsalve lift bag had its beginnings in 1977 when the company was chosen by the US Navy to produce a range of standard open and closed bags. Their continued work on cutting edge projects allowed for the development of their unique lift bag shape and the high-performance products in the Subsalve line today. Subsalve designs have evolved with the advancement of technology and materials and will continue to rise to the needs of their diverse clientele. They are committed to the tradition of research, development and comprehensive hands-on testing that has made the Subsalve company the clear leader in underwater lift bags. Designed as a multi-purpose bag that can be used as a lift bag, an upline float, drybag, or an inflatable dive flag/float. 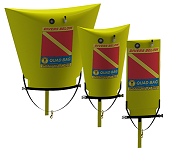 SUBSALVE USA Quad Bags are manufactured of high-strength, lightweight, vinyl-coated nylon fabric and roll up small enough to carry on every dive. They are screened on both sides with a bright red "divers down" flag for high visibility, and are equipped with an oral inflator and an optional lanyard-operated dump valve. A must for tech divers, wreck divers, beach and boat divers. Quad bags available in four sizes: 50 lb., 100 lb., 200 lb. Commercial Lift Bags are especially suited for remote locations or for deployment from small craft. The Commercial Lift Bags have 6000 lb. rated strength, resin-treated nylon lift straps sewn directly to the bottom of the lift bag, and has a safe working ratio of 6:1. Commercial Lift Bags available in three sizes: 100 lb., 200 lb., 500 lb. Very adaptive to a broad range of flotation needs where objects are to be floated close to the surface. SUBSALVE USA Enclosed Flotation Bags' totally-enclosed "pillow" shape allows the bag to be used in any position – upright or flat, outside or inside of structures. There are a multitude of rigging combinations. Perfect for vessel salvage, automobile recovery and emergency Rotation systems for ships, aircraft, submersibles and ROVs. All EFBs can be used with a single pick point with the shackle supplied on the bottom of the bag. EFBs can also be inverted to use the two stainless steel rings on the top of the bag with two pick points. SUBSALVE USA Enclosed Flotation Bags leave the manufacturing facility equipped with all necessary hardware and are ready for immediate use. Each SUBSALVE USA Enclosed Flotation Bag is tested prior to shipping, and must pass rigorous U.S. Department of Defense standards. EFB design incorporates a heavy nylon lift harness built into the body of the lift bag, and has a safe working ratio of 6:1. The VRS 2000 is the first and only self-contained underwater vehicle recovery system available today. Using state-of-the-art design materials and manufacturing processes, this all-purpose system is designed to be portable for rapid deployment, and is the result of an 18-year evolutionary process drawing from hundreds of product applications, combined with technological advancements. SUBSALVE USA engineers and technicians have worked with the commercial and public safety diving communities to develop and refine this system, not just on the drawing board, but in the water on recoveries. With the lift rings spaced at 40" apart and the carabiner on the end of the chain, attachment to the front and rear bumper or shock brackets of most vehicles is quick and easy. 2-2000 lb. 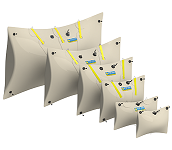 enclosed flotation bags equipped with a pocket to contain an 80 cu. ft. aluminum scuba cylinder. The lift bags are manufactured from a high-strength, urethane-coated, nylon fabric which is highly abrasion, oil, and UV resistant. 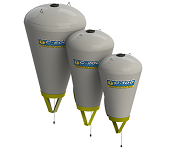 The air cylinder is connected to the lift bag with a scuba yoke and hose assembly with a one-way check valve to allow for easy tank changes while preventing any loss of air from the bag. The attachment design includes 2 stainless steel lift rings on the top and 2 on the bottom of the bag, allowing the lift bag to be rigged either flat or upright. The bottom lift rings are each equipped with a 3' length of 1/4" galvanized proof coil chain with a stainless steel snap carabiner on the end. VRS 2000 ( US Patent No. 5,755,172)- Vehicle Recover System (includes 2-2000 lb. enclosed flotation bags). Each lift bag assembly is stored and folds back into a heavy-duty, zippered carrying case with nylon handles and an adjustable shoulder strap. The VRS 2000 System comes complete with all of the components packed into two carrying cases, each of which measures 51 " long by 20" high by 10" wide and weighs approximately 65 lbs.